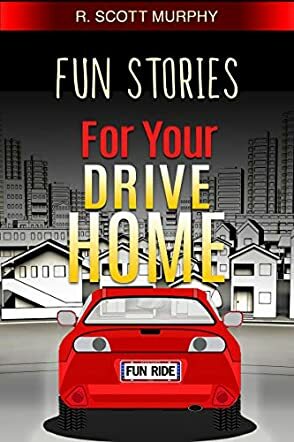 Fun Stories For Your Drive Home is a collection of humorous essays and flash fiction stories written by R. Scott Murphy. Scott is the creative genius behind Mental Kickball, an interactive storytelling social media game. The stories he offers in this book give the reader an insider’s look into Mental Kickball as well as an open invitation to participate in the process. In Chapter Four, he discusses first jobs and his own experiences as a busboy at the Family Fish House, including that one terrifying day when Helga, the assistant manager, “an inappropriate kisser” at best, demanded that he accompany her to the women’s room for a special project. In Chapter Eight, he challenges his readers to make their opinions known on whether dogs should be attired, and he invites those readers who have dressed their dogs to send pictures. Good Folks, Bad Coaching (Four-Year-Old Soccer) concerns the ins and outs of coaching four-year-olds, especially when one’s own child is one of the participants. This chapter, surprisingly enough, was really quite entertaining, and not in an “aw, how cute” way either. R. Scott Murphy’s collection of humorous essays and flash fiction stories, Fun Stories For Your Drive Home, made me sigh a bit as I finished the last page. Murphy is gifted at interacting directly with his readers. It’s hard not to get so taken up with his conversational way of writing that you won’t find yourself answering him aloud or seriously thinking about looking up his interactive website. I especially enjoyed Chapter Ten: Monday Scott Hates Friday Scott, which will have a universal appeal for anyone who’s been a wage slave at a nine-to-five job, and his story about the cub scouts and his fling with the Pinewood Derby is classic. Murphy openly admits to his addiction to Googling anything and everything, something I share with him, and I found myself early this morning Googling personalized bobbleheads -- not an activity to be recommended for the faint of heart. His suggestions for the unfortunate few who are actually gifted with bobblehead homunculi of themselves might be worth keeping around -- just in case. Fun Stories For Your Drive Home is a lot of fun, even if you’re not driving home. They’ve certainly made me one of R. Scott Murphy’s fans. It’s most highly recommended. Fun Stories For Your Drive Home is part of an ongoing series of books, audio books, albums and singles (I counted twenty currently available… there may be more) designed to brighten your day. This particular eBook is written to alleviate the boredom endured by commuters who often suffer grueling trips to and from work. Mr. Murphy asks to be considered as part storyteller, part game show host, part DJ, and part madcap tour guide. Operator of the Mental Kickball website, Murphy also invites readers to join him and his merry band of followers… simply look for mentalkickball-dot-com. For the stories themselves, I have to say I didn’t find them belly-laughing, tears of joy funny, but they are all well written, interesting and definitively NOT a waste of the precious time incurred while commuting. Murphy excels in anecdotal interpretations of everyday events to which almost every reader can clearly relate. From “BIG BOBBY,” the football player who finds himself in an embarrassing situation, to a story that deals with “Murphy’s Law” (not the author Murphy, the Murphy who composed a series of laws of which “Anything that can go wrong, will go wrong” is the most famous), R. Scott Murphy kept my attention and turning the pages in one sitting, similar perhaps to an hour-long commute. For readers who will spot incidences similar to their own experiences, this book will have you laughing out loud. For readers like me, who can’t really relate from personal experience, a grin, a smile, and a feeling of satisfaction will surely follow the final chapter, “Clown Commuter Awards: Lane Beggars,” and have you looking for one or more of the nineteen other Mental Kickball books from R. Scott Murphy. Well done, highly recommended. In Fun Stories For Your Drive Home by R. Scott Murphy, readers will step inside the weird and wonderful world of the human race, and the normal folk who have to interact with them. When you feel you are having a bad day, then this book will make you realise your life isn't that bad. You could be Big Bobby from the 10th grade, who was humiliated in front of the entire school. Or the customer of Crazy, who dared to complain about his meal and paid the price. Join Murphy as he discusses topics such as Girl Scout Cookies, and the nightmare possibility of them going on strike. Also a word of wisdom on how to deal with annoying marketing emails and Lane Beggars. His life lessons and stories will have you wincing with embarrassment and thanking your lucky stars the awful incidents didn’t happen to you. I laughed all the way through Fun Stories For Your Drive Home by R. Scott Murphy. The author has a fantastic ability to bring characters and stories to life. I could relate to a lot of them especially Monday Scott Hates Friday Scott. I have worked with people exactly like that. The unbelievable tale of Crazy in the restaurant getting her revenge was toe-curling. My favourite tale has to be when Scott tried coaching a team of four-year-olds in soccer. Highly recommended to anyone who loves dark humour and a good old rant about life. However, you will have to read this book alone because you will laugh out loud throughout. One of the greatest stories is the desperate hunger and need for Girl Scout cookies late at night. When this occurs, one will do what is humanly necessary to get the hunger pangs satiated. Another great piece is when the author says: “The future of America is not in the hands of the Republicans or the Democrats. It’s not even in the hands of the military. Our future is going to be determined by the people that control the Girl Scout cookies.” Other stories have interest as well, but some of those above need some careful reading attention. A very entertaining read.